If we often monitor the development of health blogs by using web mastertools, would someday find the term tag hreflang. 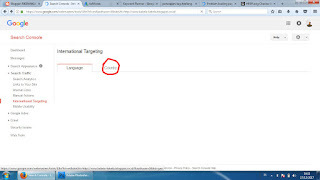 When in account web mastertools, try click fads in the search traffic continues to go to international targeting, well do not be surprised, the term tag hreflang you will find there. It sounds so strange this one tag and there must be a question that hangs in our minds, what exactly is the hreflang tag, then what is the bad effect if it does not put a hreflang tag? We leave for a moment what the google webmaster experts said. The hreflang tag is actually a language or term used by google as a symbol to denote the language of a country. This means that, if our blogs speak indonesian then the symbol known by google search engine is id, even for English-language blog for united states is us-en. Point, these symbols to notify the search robots when crawling that the language of our blog for example using Indonesian or English with the target that we aim at the country of Indonesia or the United States. So if this hreflang tag is not in pairs template our blog, then from where search engines will know the language used by our blog. This will make the search robot confused to translate all the article posts in the blog. Try to think! Growing a new question, if we do not put hreflang tag how? is there a bad effect on our blog? This is a critical question, and I salute those who think like that. This can not be considered a trivial matter, because this could be one source of disaster does not go up our blog traffic. 2. The number of articles indexed by google search engine, not in accordance with the number of articles we post. 4. Be the source of the emergence of broken links for sites that berplatform blogspot. Some blogger explanations on some sites I read, seem to think hreflang tags have no effect on blog traffic. This is a false idea, but I appreciate their opinion that way. But if it is linked with blogspot.com platform changes to blogspot.co.id then the bad effect of not installing hreflang tag will be felt up to the bone of the sum. This is an experience that I experienced myself, when trying to check the number of broken links my blog, then read my blog platform is not blogspot.co.id but blogspot.de (de is tag reflang Germany). because the robot search google arbitrarily translated our blog articles, thought to use the German language. Unfortunately also due to automatic changes to the platform from blogspot.co.id to blogspot.de, this is considered broken links so that in a chain, easy to guess, the edges would be blog traffic will be destroyed, squat. Another problem, too, if the number of broken links in a site too much then very damaging reputation in the eyes of google search engine. Obviously, the page authority site is very low, considered unprofessional and only the origin of the affairs. When it comes to my mind, it arrives at how to install the correct hreflang tag. Many references are scattered in the networking network hreflang tag installation script that the model is like. I think using the tools help will be more accurate hreflang tag writing script, away from the impression as the saying goes buy a cat in a sack. For how to use is easy enough, after entering the site page immediately fill in the form that is available such as blog url address, then in the next form select the language option used in the blog and the last stage select the destination. 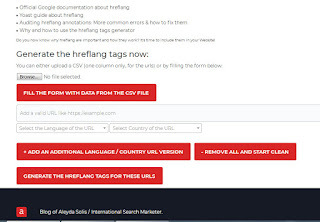 Fill in the form that says "add an additonal language / country url version" if you intend to expand the coverage of readers from other target countries such as Philippines, Singapore, Brunei ..
Once all the forms have been filled in, click on the part that says "generate the hreflang tags for these urls". Wait a few moments, then at the bottom will be presented tag hreflang your blog is ready to be installed in the template.